An epoxy floor coating is a great way to enhance the look of your warehouse without going to the cost or inconvenience of laying a new floor. Whether you’re looking to improve the appearance of an older floor or considering colour coding areas of your facility, Warehouse Floor Marking Ltd can provide the perfect solution. As with durable line markings, a quality floor coating starts with the preparation. Vacuum shot blasting the surface prior to painting ensures a clean, open surface that the coating system can key with. At Warehouse Floor Marking Ltd we use a 2 part epoxy system for our coatings, this type of system has proven over many years to be the best in terms of durability and aesthetics. Typically a 2 part epoxy system gives a gloss finish which is perfect for reflecting light and giving warehouses a brighter feel, however they can also be laid with a matt finish if preferred. 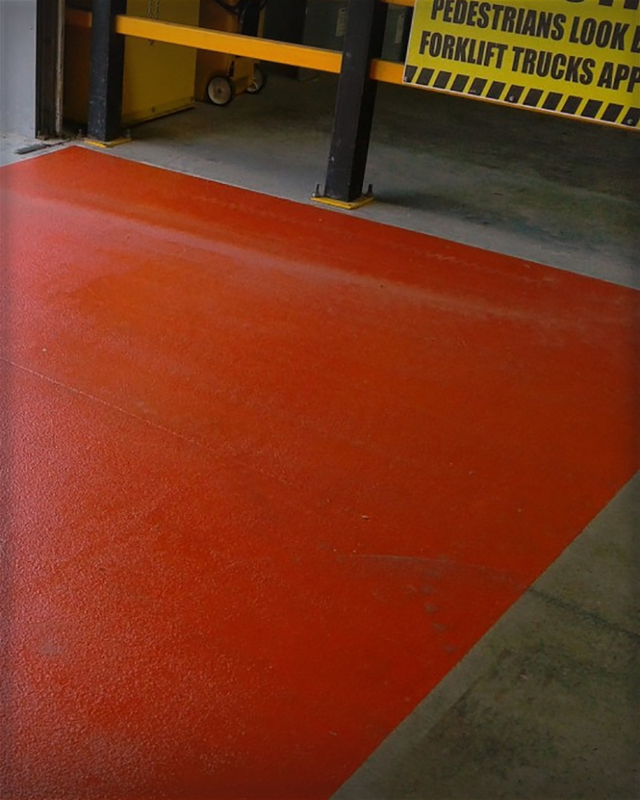 Partial floor coatings or ‘block’ coatings are very popular in MHE charging areas as they clearly identify the area and also help protect the slab against chemical spillages. When an anti-slip aggregate is added, this also makes the coatings ideal for areas in front of dock doors as it helps to remove moisture from incoming FLT’s and prevent accidents caused by them sliding. All coatings are installed by our fully qualified installation teams who are strategically placed throughout the UK. By using the most up to date methods of installation and materials available, we’re able to upgrade your current floor and completely change the look of your facility in the space of a weekend. If you would like to arrange a visit to discuss how Warehouse Floor Marking Ltd may be able to help you, please don’t hesitate to contact us today. We can usually arrange for a representative to visit site within 24 hours. Resin floor coating projects can be extremely complex, lets start the discussion, contact us today.